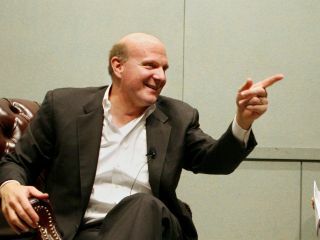 Comments from Microsoft's Steve Ballmer over resurrecting talks with Yahoo, gave the latter's shares a 17 per cent boost. Following the protracted and ultimately unsuccessful takeover attempt by Microsoft, Yahoo's assertion that the $47.5billion bid undervalued the company has looked increasingly absurd. Microsoft (MSFT:US) offered $33 a share in July, but the economic downturn had pushed Yahoo's (YHOO:US) value down to just $11.37. Speaking at the Gartner Inc conference, Ballmer suggested that a search advertising deal was still possible, and despite assertions from the company that a wider takeover remained past history, did not rule out a return to the negotiation table. "Perhaps there will continue to remain opportunities to partner around search," Ballmer told a Gartner Inc conference in Orlando, Florida. "We are not in any discussions with them. We'll see. They want to remain independent. There are probably still opportunities around search. I think it would still make sense economically for their shareholders and ours." When asked by an analyst about another bid for Yahoo, Ballmer added: "We offered 33 bucks not too long ago and it's 11 and a half. So I don't know what price might have got the job done. "It's clear that Yahoo did not want to sell the company. It did not want to sell when we offered 33 ... They probably think it's worth at least 33 today." Although a Microsoft spokesman reaffirmed the stance that the company has "no interest" in resurrecting its bid, Yahoo's shares were boosted to a high of $13.73. It's not often that Ballmer adds value to Yahoo.